Over the past two months, I interviewed close to 100 bootstrapped entrepreneurs as part of the Bootstrapping Summit about the steps they took to validate their ideas and acquire their first paying customer. No matter how many stories you and I have heard about bootstrapping and idea validation, some of the lessons learned from the journeys of those entrepreneurs are overwhelmingly insightful. Halfway through the interviews, I started to see a common pattern in mindset and approach so before we get to the idea, validation and bootstrapping for many of those 95+ entrepreneurs, here are four key lessons learned along the way. No one gets it right the first time. I spoke with Jon Sebastiani about the story of KRAVE, a Jerky brand he sold to The Hershey Company for over $200 Million in less than 5 years from inception to exit. At first sight, it’s a 5-year overnight success but when you listen to the journey of Jon, you’ll find over 2 decades of ups and downs running multiple businesses and leading his family’s winery to a sale after a century in existence. Every story followed the same pattern. No one gets it right the first time. Here’s another story. There are many reasons why entrepreneurs choose this path over a more traditional route of becoming employees. The ability to control your own destiny, building value from scratch, making a bigger impact and setting your own hours are just a few of those reasons. But there’s a cost to that, sometimes a big one. Josh Elledge started and failed several businesses until his series of failures led to his overnight success, literally. No one wants to get to a point financially where they spend most of their time finding coupons and deals to cut their shopping bill. When Josh ran the numbers, he realized he could reduce grocery expenses by $200 every month if he takes advantage of the deals. His idea? a membership site where people can get access to a curated list of discounts and coupons for grocery shopping. Keep reading to see how he validated the idea and got his first subscribers. This story and many more, lead us to the next observation: all success stories are a result of a combination of mini successes and failures. What matters is that you do things. In my conversations with the founders, you will hear me note that most entrepreneurs, including myself when I started, think too much about their company and themselves 5-10 years from now that they end up doing nothing today. The thought of realizing that it’ll take all of these years to get to our optimal scenario often discourages us to take a small little step forward, today. If you’re not sure about the idea, Yes, go to conferences, read books, take courses, seek mentorship, etc. but none of that matters if you don’t start anything even if it’s a small project over the weekends. If you’re not sure your idea or product will be needed, go ask if it will, meet people, listen and then make wiser decisions. If your dream is too big for your available resources, stop wasting time seeking funding for an idea and start building stuff. If you need to freelance or get a part/full-time job to raise some funds, do what you need to do. In fact, Mikita Mikado, founder of PandaDoc, highly recommended that every entrepreneur starts by serving their potential product users in any way possible before creating the product. He talks about consulting and freelancing as a way to interact with your customers and get into the core of their pains before building anything. Plus, he says, it’s a great way to get paid for learning from those who will use your product in the future. I (we) didn’t speak with enough customers. Here’s the surprising fact. Most interviewed founders run or have exited a multi-million dollar startup and yet their number one regret is that they didn’t speak with enough customers. According to the founders, meeting with more customers would have saved them months and thousands of dollars invested in projects that weren’t needed. That is not the surprising fact, many founders note that speaking with too many customers isn’t smart either. Information overload has cost many entrepreneurs many months sorting through the data when the consensus was clear since the second or third rounds of interviews. Before we proceed, in this checklist, I listed the different validation approaches and their steps. Download it and reply to the confirmation email with the steps you believe you should take to validate and/or take your venture to the next level based on the information you found in this post. I will reply with my comments shortly after. One of the other common mistakes I found among different entrepreneurs is that many do a great job at learning the “what” part of the solution, that is, what to build to solve the problem but not the “how.” Spending time with customers to learn about their needs is one part of the equation, learning how to address those needs is another as important part. Besides constant communication, the founders suggest releasing your product versions quickly even to a smaller sample of your customers. This will ensure you’re doing the right things or the wrong things. Either way, you’re a winner. Take the example of Drew Little, founder of Red Giant. Drew took an interesting approach to bootstrap the initial stages of the company in an industry and at times when software was very costly. Later, with an established company, he spent a million dollars creating a product that no one bought despite the focus groups and meetings he had with supposedly his potential buyers. Now take the example of Nathan Hirsch, founder of the freelance marketplace, FreeeUp. His startup is a little over 3 years old and today generates over $9 Million. 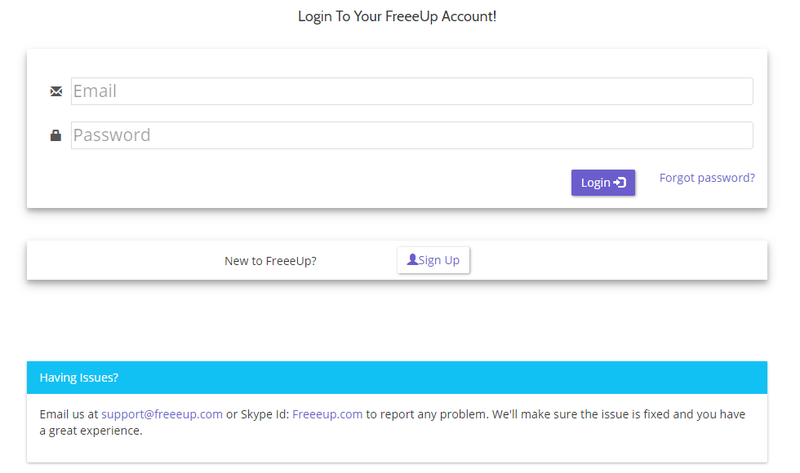 Visit FreeeUp and you’ll see that the platform still looks like it’s still in its earliest development stages. Here’s the login page. Nathan had previously done a great job building a multi-million dollar e-commerce business on Amazon and started FreeeUp by inviting the people he met through Amazon and e-commerce communities. He didn’t need a website to validate his idea. See more below. The first customers won’t come knocking. Your existing audience/customer base. Whether you have a big audience or just a few freelance clients, if you’re building the solution for them, they’re more likely to be your first paying users. Omar Zenhom referred to his $100MBA audience to sell the idea of WebinarNinja, Justin Hartzman leveraged the audience of an influencer to sell the idea of Needls, Keith Perhac built SegMetrics for his consulting clients and so did Micah Mitchell with Memberium. Sales the old fashioned way. Before running any ads and before investing any resources in content marketing or others, chances are, with a mediocre product, no one will trust your solution. I found a common pattern in the way the interviewed entrepreneurs acquire their first customers if they don’t have an existing audience/network to tap into. First, they start with close friends and ask for recommendations to their friends. Second, they go back to the people they interviewed to learn more about their needs and expectations. Third, they list their potential buyers and find a connection to them through friends or acquaintances and then reach out for a call to discuss the product. Before launching Croissant, a one pass access to hundreds of workspaces all over the world, Dave Idell and his co-founders had already been part of a few hackathons which gave them an opportunity to meet owners of workspaces in NYC. When they launched Croissant, they started by recruiting the workspaces they worked at. This gave them proof that made it easier for them to convince other workspaces in the city. To partner with other workspaces, Dave notes that after a cold email or two, he would call and finally show up to tell them about Croissant. It wasn’t until his platform had over a hundred workspaces that companies started reaching out seeking to list their space. Which also was how Airbnb started. Kale Panoho presold over $200,000 in gym memberships with $200 in the bank and a small network that consisted of family and friends. Here’s the $200,000 question that got Kale and his partners to presell memberships within 14 days: is there anyone you know with the same level of relationship we have that you can recommend us to speak with? This question led to a network effect that turned into a snowball effect when the people he met with started sharing the launch of the gym with their family, friends and acquaintances through social media. Learn more about getting the first customers in this post. Fact: if your product needs to exist, it will exist. Take the example of RightMessage. It took Brennan Dunn 5 days to raise $500,000 he wasn’t even seeking. It started with an email from one of his friends, CEO of Teachable, who liked the product and wanted to see it go to market sooner. Brennan sent a few more emails to some friends and clients and within 5 days, he had $500K in the bank. Croissant raised over $150,000 just by applying to competitions and grants. Dave says he got the announcement about the first grant he applied to in a newsletter which turned into a big check he wasn’t really looking for in the first place. Mike Wilson built Tinyme, a company that makes personalized kids products, by borrowing some equipment from his employer. In a period where the cost of building technology was at its highest in the 90s, Will Bunker bought a programming book that taught his how to build the first phases of OneandOnly which went to outperform a well funded competitor, Match.com. Long story short, if you’re not willing to work with the resources you have and if you’re not willing to create your own resources, maybe you’re not meant to be an entrepreneur. Learn more about alternative funding sources in this guide. And use the strategies in this post to minimize costs. You can find more information about self-funding sources here. If you’re in business or have read any article about starting a business, chances are you were advised to validate your idea. How? Make sure they have a problem worth solving. Make sure they’re willing to pay for a solution. Then, build a product and sell. Clear? Yes. Easy? Probably not. For first time entrepreneurs or existing founders looking to build a business in a different space with a different model, it’s never easy to navigate this process without help. Here are some examples from the summit to show you different ways entrepreneurs validated their ideas and built growing companies. Whether you’re building digital products, software, hardware, agency services, e-commerce products, or a book, you need to validate your idea. And luckily it’s likely I have an example that applies to you. Ready? Let’s go..
Here’s how Kale Panoho validated the need for a gym in his hometown, Cromwell, New Zealand, and pre-sold $202,000 worth of gym memberships within 14 days, without an email list, Facebook group, gym location, or funds. According to Kale, in leveraging the power of a network to validate an idea through presales, most entrepreneurs have some form of target but not a certain dollar figure around that presale campaign. More importantly, most founders don’t work backwards in terms of how they will reach their goals conditioned on the viability and need for the product. Another common mistake is that many entrepreneurs are looking for relationships post-launch when the key to validating any product or service regardless of whether it will be presold or not, is to build and nurture relationships well before the idea of the “launch” so you could capitalize on them, that is, have a reliable source of feedback and cash if the product is to be offered for prepurchase. The idea of building and nurturing relationships is based on the fact that people will buy from those they like and trust. If you wanted to buy a car, you may spend hours browsing for the best models and deals online but chances are you asked a friend or family with some knowledge in the space. The problem when it comes to building a network effect for a presale campaign is that it takes time to build relationships like that. Generally, what you want to do is appeal to something the person in the relationship is interested in. When launching the presale campaign for the gym, Kale researched relevant journalists and approached them with an area of interest that picks their curiosity based on their previous publications and social media shares. List people you know within your network who fall under your target buyer segment and are likely to share honest feedback. Reach out to learn more about their needs and expectations and more importantly, ask for referrals to at least one more person they have the same level of relationship you have with them. Reach out to the referred people, learn more about their expectations and follow the same idea as in step 2, ask for referrals. As you’re building this network effect, start organizing a local event around your product idea. In the case of Kale, he negotiated to rent the potential gym location for a weekend. That’s where he gathered everyone he spoke with. During the event, share some samples of the product or show how it will look when it’s ready. Kale used posters of gym equipment. Ask for customers’ commitment by preselling the product or service. If not enough people buy, return the funds. If you reach your goal, you have your validation and the green light to invest the revenue and open the business. It took Kale 14 days to go from idea to $202,000 in presales! Learn more about preselling ideas in this guide. You have an innovative design idea for a product? Did you get a chance to see the movie Joy? That’s the approach Steven Sashen followed to validate his idea for Xero Shoes. After getting constantly injured, someone recommended that Steven runs barefoot. Taking off his shoes eliminated his injuries but wasn’t a sustainable solution for some surfaces. He used some cords and rubber he bought from Vibram and made himself a pair of shoes that are thin enough to give him the barefoot experience but thick enough to protect his feet. How did he validate the idea? He went back to his community of runners and started running with the shoes he made. When other runners asked about the shoes, he traced their shoe sizes on some rubber and made them a pair with his own hands. A dozen orders later, he knew he was onto something. Steven is not the only entrepreneur to build a business out of a solution he created to address his own needs. For instance, to promote his book, Tim Fargo created a social media management tool that enabled him to schedule and share content 24/7. Unexpectedly, people started reaching out not learn more about the book but to inquire how he’s able to share that often, all the time. That was the beginning and validation of Social Jukebox. Build solutions that solve your problems and address your own needs. It doesn’t have to look good or work great as long as it gets the job done. Don’t keep it a secret. Interact with people who are facing the same problem and share with them what you’ve done to solve it. Both Steven and Tim did this. Ask them to pay for it even a little. It isn’t until they pull cash out of their pockets that you truly know it’s a product worth investing in. 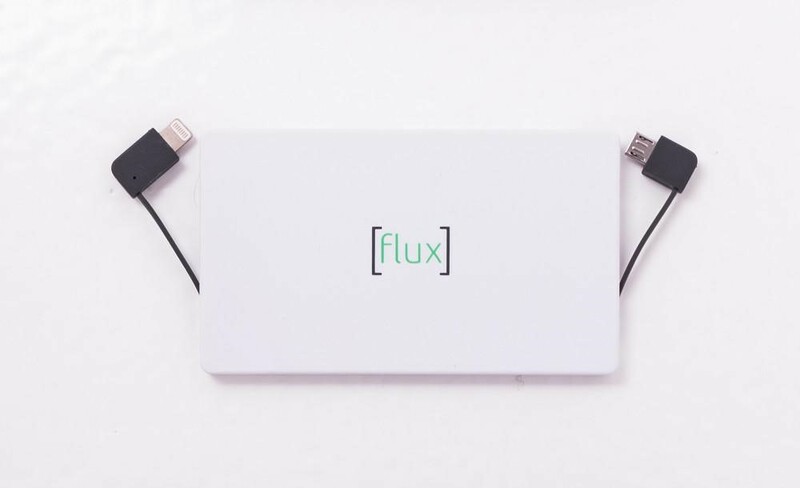 To validate the idea of Flux Charges, portable charges for iPhone and Android, Alejandro Rioja and his co-founder purchased a sample of every competing product on the market. After evaluating the design and performance of the products and after hearing what some customers of their competitors had to say, they contacted a Chinese manufacturing company through Alibaba and asked them to design and ship a few chargers for testing. If you’re not feeling the pain or need for the product, interact with those who do. Use available and cheap resources to create a sample or prototype as long as it can solve the identified problem. Sell it. If they buy, pre-sell it to other potential customers. if they buy, you have sufficient validation to proceed. Micah Mitchell, founder of Memberium, a platform for creating membership sites, used to be an Infusionsoft consultant before he started the company. When many of his clients asked for custom membership integrations, he realized that his business consisted of a codebase he was selling over and over again until he decided to turn it into a platform. Micah’s the first validation round was unplanned. Clients’ requests for membership sites and integrations proved their need and willingness to pay for the solution. He continued to build membership sites for his clients while he was building the initial versions of Memberium and his product development and consulting clients were his first testers. When they started relying less on him and more on the product he created, he knew his idea was validated and that’s when he “fired” his last consulting client to focus on growing Memberium. Jeremy Ellens, founder of LeadQuizzes, Mikita Mikado, founder of PandaDoc, Kyle Racki, founder of Proposify, Mike Cheng, founder of Sniply and Lumen5, Zvi Band, founder of Contactually and many more entrepreneurs have built products out of services, that is, they have taken the insights they gained from selling product development, design and consulting services to build a scalable solution that can be used by thousands of people without their direct involvement. If you don’t have an idea yet or not confident enough to take it to market, start by freelancing. Many multi-million dollar companies started by taking freelance projects like Mailchimp, Sumo, Kissmetrics, Basecamp and many others. Pay close attention. Are many of your clients requesting the same thing? are there products on the market that could be used instead of building a solution from scratch? if Yes, why aren’t people using them? if No, what does this product need to have and do to address customer needs? Build a small version and start by releasing it to your customers for feedback and testing. Fascinated by the lean startup movement and aspiring to contribute to the model, Ash Maurya started his journey to selling 100,000 copies of his book idea, Scaling Lean: Mastering the Key Metrics for Startup Growth, by putting his ideas out there through a series of blog posts. Ash said, “I had no plan for becoming an author.” The blog posts he wrote over several months were meant to sharpen his own thinking but when an audience emerged and showed interest in his contribution through comments, citations and shares, he turned his scattered blog post ideas into a book. Ash’s story is not the first to use blogging to introduce and validate new ideas. Sangram Vajre, co-founder of Terminus, started by sharing his Flip My Funnel ideas through LinkedIn posts. When he saw the engagement the posts were creating, he decided to create a conference and invite industry leaders to discuss sales and marketing in B2B. The idea of Flip My Funnel is simple. Instead of advertising and selling to everyone that falls under a target segment hoping that a tiny percentage will eventually convert, leverage data to focus on those people you believe will be at the end of the funnel and will buy from you. Through the conference, Sangram and his team closed several clients to their early stage startup Terminus which implements the Flip My Funnel idea. Within one year, Terminus generated $1M in annual recurring revenue (ARR) and last year, they closed their Series B round of $10.3M. 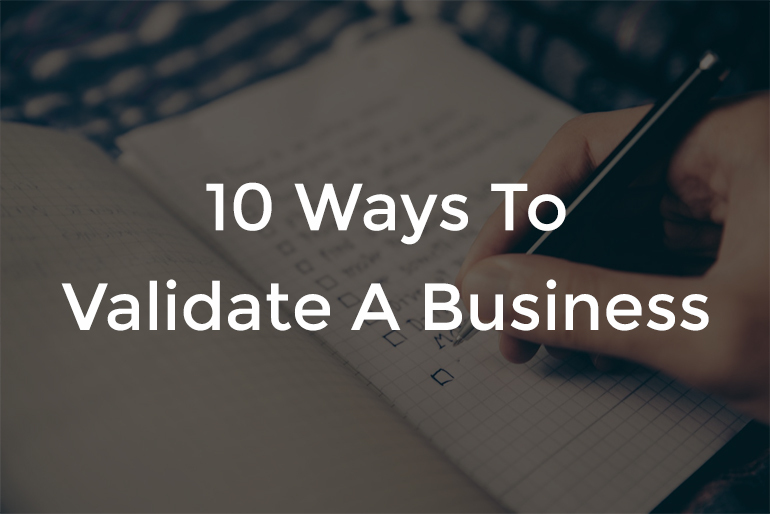 So, how can you implement this approach to validate your idea? Sangram said, “if you’re not building an audience, you’re building a commodity.” In other words, first, invest your time to build an audience through blog posts, conferences, partnerships, etc. As you’re building the audience, don’t be afraid to share your ideas or at least raise the questions about the problem you’re looking to solve. If no one cares, move on but if you see an engagement, you have your early validation. With some signs of validation, that is, people asking follow up questions, commenting, sharing, requesting more information, etc. don’t be afraid to ask for a commitment to pre-purchase a book, a software, a digital product, a gift card for your brick and mortar business, or virtually any type of business. Consultant, teacher and founder of RightMessage Brennan Dunn said, “Conferences are much more effective than sending a bunch of cold emails to people. 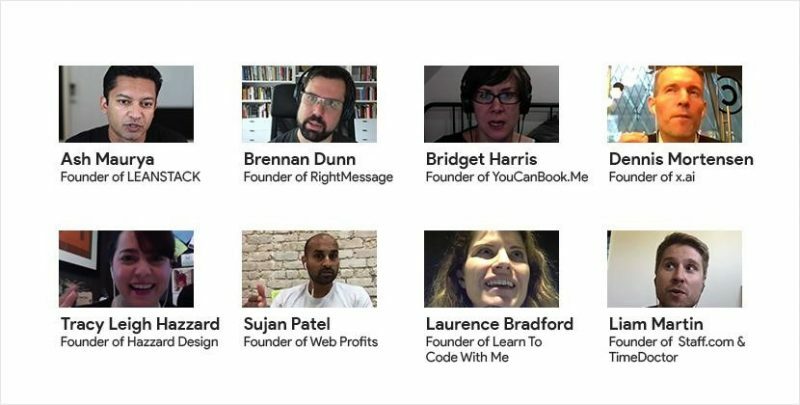 If I didn’t build up that network, it would have been really hard to get the funding to get this business off the ground.” Just like Micah Mitchell with Memberium, Brennan founded RightMessage after consulting clients and building them high converting pages by personalizing their messaging. Today, RightMessage allows you to change your content and calls to action based on user behavior and where the visitor came from. When he saw firsthand how effective personalization was to improving conversion rates, he created and tested a tool that lets you change your message on your website pages based on where the visitor came from. Thanks to the relationships he built with the founders of Teachable, ConvertKit and many other successful companies, the CEO of Teachable offered to invest in his company to get it built sooner. On a Monday, Brennan sent a few emails to some of his network of entrepreneurs and by the end of the week, he raised $500,000. Today with a big community, he said that when he was starting, he would have loved that people with an email list agreed to promote his services but he was rarely successful at convincing them. What worked was investing in conferences and building relationships. Brennan had no idea he was going to build RightMessage when he started investing in attending conferences, building and nurturing relationships. No matter where you are in the process, building relationships should be one of your top priorities. Share your work. RightMessage was just an idea when he sought feedback from his network. So that by the time you build a solution worth paying more attention to, those potential partners will turn into contributors and investors sooner. Don’t hesitate to ask. Brennan wasn’t planning on raising money but when the CEO of Teachable offered, he emailed other people and many of them joined the investment round. For Omar, his concern wasn’t how many people will commit to his idea for WebinarNinja, he wanted to know whether anyone at all will commit. So without investing a lot of resources on the quality of the sales page, whether it’s layout, copy, image quality or sales funnel, he launched a landing page and over one of the live webinars he was hosting every week, he shared the idea of WebinarNinja and opened the cart for the first 250 people. Build an audience by creating valuable content and building trust exactly how you build and nurture relationships with your network. This is accomplished not only by sharing content but also answering questions, engaging and supporting. Ramit does a great job at this. Before even creating an MVP, try selling the idea to a sample. The advantage of having an audience that trusts you is that they can help you build the product and will be patient with you. On the other hand, Justin Hartzman didn’t have the audience Omar had but he found a way to leverage the audience of influencers to validate the idea of Needls, a “robo” social media advertising agency, and presell the product generating $500,000. How? He built a revenue sharing partnership with an influencer in his space who liked the product and felt like it will benefit his audience. Justin had an MVP when he and the influencer announced presales through a live webinar. Think about the number of business ideas that could have leveraged the power of influencers to attract a large number of buyers no matter the stage the company is at. The reality is, only a few entrepreneurs benefit from the power of partnerships not because every other entrepreneur doesn’t have the resources but only because a small percentage of founders invest in building long term relationships with key influencers. It is an investment. In general, people invest in others they like and trust and you can’t possibly get someone to like and trust you overnight. If you’re willing to invest in building and nurturing relationships for future win-win opportunities, you will be well off in the future. List the people you want to introduce yourself to and build a relationship with. Start with social media if you can’t attend conferences. Like, share and comment on their content. Collin Stewart attended every event Aaron Ross hosted online and sent him messages with comments and follow up questions. A few years later, Collin’s startup, Carb.io, merged with Aaron’s company, Predictable Revenue. Aaron started by referring his audience to Collin until just a few months later, he proposed the idea of the merger. Try to share as much value as you can before making an ask. And don’t be afraid to ask! You have a marketplace idea you want to validate? You’re probably one office building away! To validate the idea of TickPick, a no-fee ticket marketplace, Brett Goldberg went to every office in every building he could physically reach and offered the employees of those businesses an incentive to buy tickets from TickPick which back then was a simple MVP his co-founder quickly put together. An approach very similar to what Groupon did when it offered discounted pizza deals to the employees of the companies in their building. According to Inc., the company generated $49.7M in 2016. In one of his latest podcast appearances, Brett mentioned that TickPick’s revenue in 2017 exceeded $80M. For marketplaces, it is usually more challenging to acquire the demand than the supply side. For TickPick, the supply of tickets was abundant. Brett built convinced ticket agencies to list their tickets on TickPick and that gave them many tickets to offer and sell. For David Ciccarcelli, founder of Voices.com, thanks to SEO, voice over artists applied from all over the world to list their profile and reach clients, for FindFirewood.com, a firewood marketplace I helped create and launch, firewood sellers joined the moment we launched the website. Many of them we found on Craigslist. To validate the idea of a marketplace, we need to focus on the demand. Define and identify your target buyers and sellers. Start with the supply. You don’t need hundreds, recruit just enough to test the need. To speed up the process, you could serve as the supply side if possible. Your first 100 customers (demand side) will usually buy into you (you the person) since today, most products and services can be found through competing marketplaces or other mediums. Spend less time creating ads and more time personally reaching out to people. Define your key validation criterion. It could be number of listings, transactions, percentage of people who reuse the platform, etc. And let me end this short summary of the lessons learned documenting the early stages of 90+ businesses with the story of Josh Elledge whose series of failures led to his overnight success, literally. As I mentioned earlier, after several failures, Josh had to find ways to cut cost and realized that the first thing he could do is take advantage of special deals and grocery discounts. After he’d put everything on an excel sheet, he was able to cut at least $200 in grocery bills per month. His idea? Create a membership site where members get access to coupons and special deals from many stores. But Josh could not wait any longer to validate his idea and acquire his first members so with just an excel sheet, he beat his fear and spent all of his time trying to get on the local radio station to speak about his SavingsAngel membership site. Soon after the interview, he generated $300 in monthly recurring revenue. Enough to validate the idea and get his full commitment to the idea. Josh had always been active in his community but hesitated to leverage the relationships he built over the years to get some publicity for his companies through radio and local events. Scared to be vocal about his products, he fought his fear after he found no other and better option to gain quicker recognition and awareness for his latest idea which eventually became a 7-figure business a couple of years later while the business model never changed, a subscription site with monthly coupons and deals. Build and nurture relationships in your field. Have a unique story worth sharing. Push and fight your fear. All of the stress will soon become history and the reason for your success. 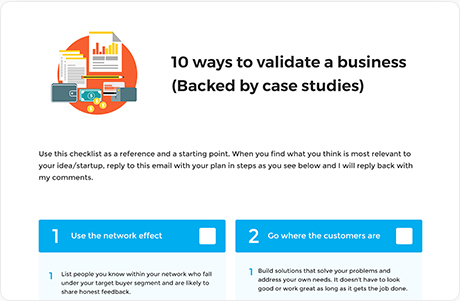 Download the checklist and then reply to the confirmation email with the steps you think you should take to validate or take your idea to the next level. I’ll respond shortly after. Want more lessons learned from the summit? Here’s the post I wrote for Entrepreneur magazine.